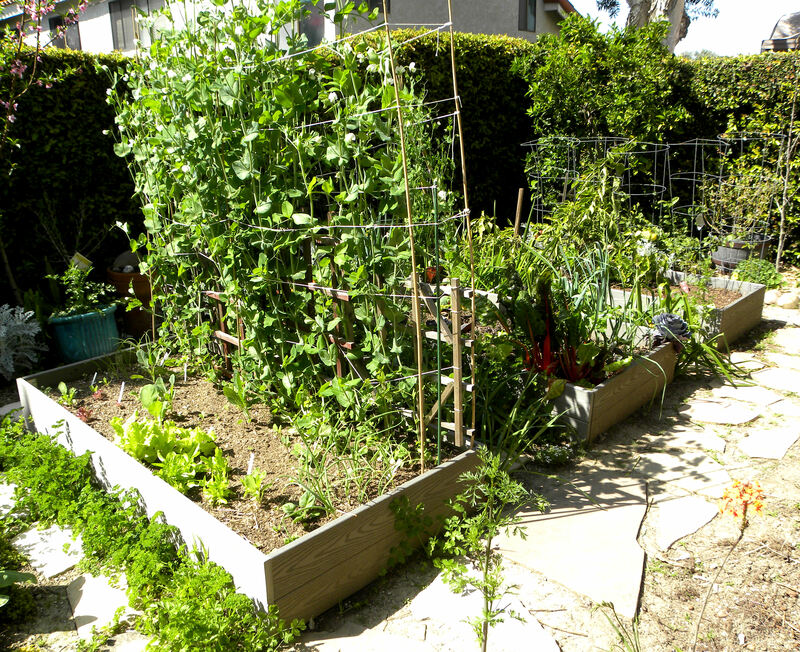 Posted on March 23, 2010	by Lou Murray, Ph.D.
Super Sugar Snap peas are towering over the other veggies in the raised beds. The harvest is beginning to pick up. I’m discovering that a garden ready to pick makes a much prettier picture than a garden that is being harvested from regularly. So I got a nice garden hod in which to present photos of the harvest. I worried that it would make a pathetic photo with one limp radish in a giant hod, but fortunately, the harvest has been a bit better than that. Here is one morning’s harvest for a salad and a stirfry that lasted us two days. One morning's harvest for a salad and stirfry--radish, cabbage leaves, lettuce, chard, bell pepper, snow peas, cilantro. 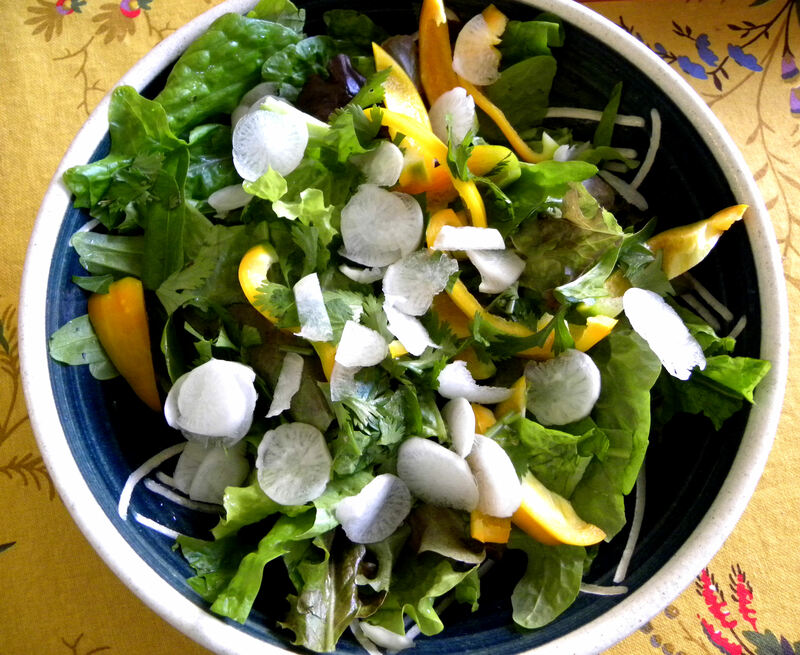 This salad has green oakleaf, black-seeded Simpson and red salad bowl lettuce, a couple of baby sorrel leaves, chopped cilantro, a German white icicle radish and a yellow bell pepper that overwintered and just now got ripe. No two of my stirfrys are ever alike due to changing harvests and the fact that I don't measure the soy sauce, mirin, rice wine vinegar and ginger that I use to spice them. Sometimes I add a sliced Hebrew National beef knockwurst or firm tofu. Forgot to mention that I fed the last of the cabbages in one area to the chickens, dug up the soil, added more compost, and planted Scotch blue curled kale, Italian lacinato kale (a new variety for me), and Chinese broccoli/kale hybrid (Ryokuho). My first leeks sprouted today; my Pink Summercicle radishes are up with huge cotyledon leaves and lovely rich pink stems. Here is my harvest for this week. I don’t count the massive amount of greens that my chickens eat. That gets counted as the egg harvest. 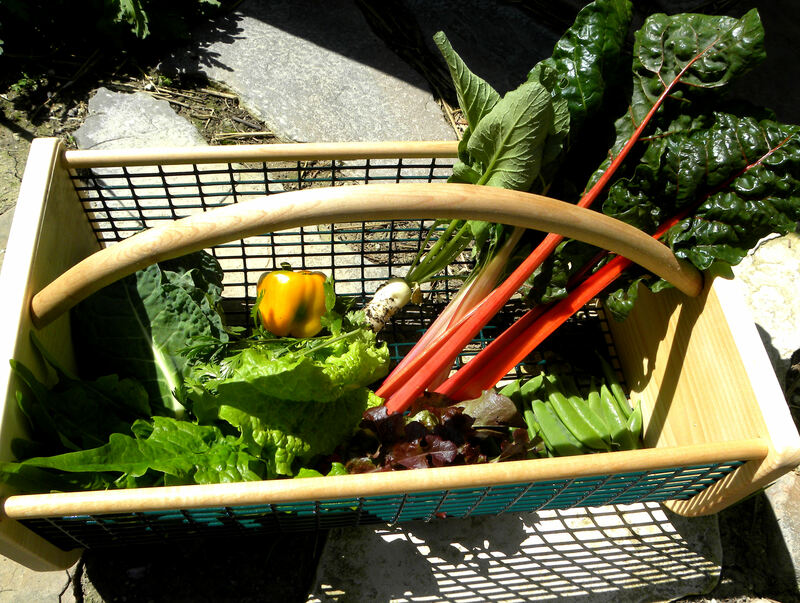 This entry was posted in Uncategorized and tagged Harvest Monday, vegetable garden. Bookmark the permalink. I love the look of red chard and it reminds me of my dinner last night though this chard did not come from my garden. Nice harvest and may many more radishes join the basket soon. Hi Ottawa, I am growing four different kinds of radishes this year, but since they’re not our favorite vegetables, I only plant a few at a time. I don’t want two dozen radishes coming ripe all at once. There is a nice variety of things in your harvest. Your stir fries sound like mine – never the same twice. They are such a good way to use odds and ends from the garden. I’d love to hear about your nasturtium vinegar and what you do with it. I’ve eaten the flowers but never made vinegar with them. Hi Villager. I’m going to make a blog about nasturtium vinegar as soon as I get it bottled. The flowers add color (and flavor?) to white cider vinegar. Very simple to make and very, very pretty result. Don’t know about the taste yet. 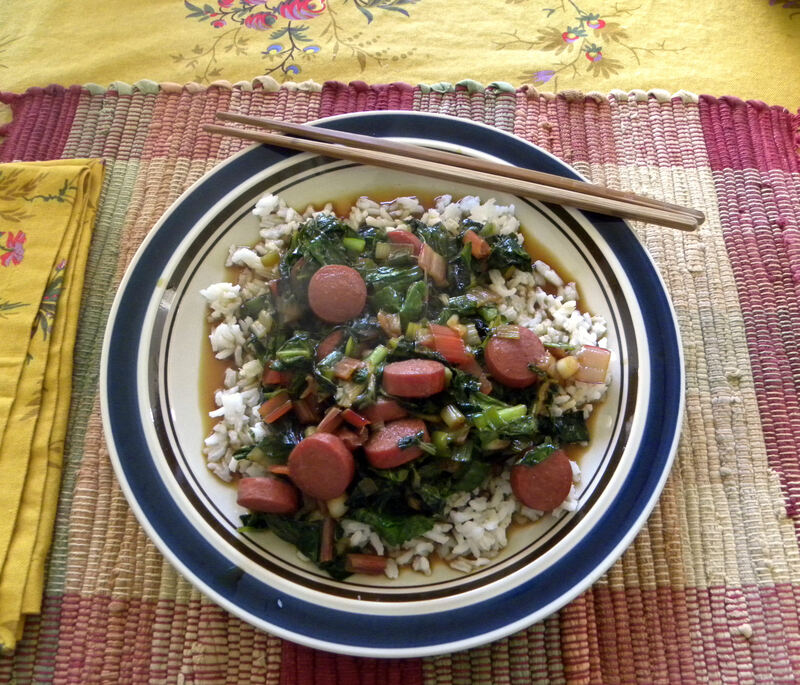 I sometimes put apple-chicken sausage in my stirfries. And like you, sometimes tofu. I’m the only one that likes tofu in my family though. I can’t imagine why they hate it but so many do. The peas were the ones making me drool this week. I think it is because I planted my peas last week and can’t wait to eat them now. Last year I grew Super Sugar Snaps too and they were just a jungle. They got way too tall for me. This year I hope to keep my peas to 3′ so switched varieties. Hi Daphne and Thomas. I’ve been thrilled with my beautiful tall peas, but over the weekend they grew taller than my head. If they get much taller, I won’t be able to reach the peas. They’ve outgrown their stakes and I need to get taller stakes today. Seems like a perfectly respectable harvest to me. Your salads and stir fry look so wonderfully fresh and inviting. Certainly a great start to spring! I didn’t know peas could grow so tall, maybe I kept picking the shoots, maybe it’s the variety I grew. The salad and stir fry look tasty. Your peas are sky high! It’s nice to see a lush veggie garden at the moment….gives us all motivation to get our spring preparations done.